The jewelry store showcase pursues a noble and gorgeous style in decoration. The store is surrounded by beads and glaring. To make these visual effects more powerful and significant, it is necessary to rely on appropriate lighting to achieve luxury under the illumination of the lights. Different jewels require different lights to work with. Gold, platinum, silver, diamonds and other jewelry are relatively small in size and require high enough brightness to be noticeable. These are all based on the reflection of light, paying attention to the direction of light incidence, so that the reflected "sparkle point" stimulation Customers' eyes; jewelry made of pearls, jade, crystals, etc., need more radiant and shiny, relatively low brightness requirements. Gold can be illuminated with 3000K cold light cups, and silver should be illuminated with 4200K or more. The general illumination in the cabinet is about 400-500 LUX 1⁄4. The key illumination is above 800-1000KUX, and the color rendering is not less than 90. The precious gold and silver jewellery, diamonds, pearl jade and other products are displayed in the form of a window, with high-brightness and high-color rendering lighting, depicting the delicate craftsmanship and high-gloss brilliance of the jewelry. The jewellery display window is generally displayed in a grid, and the lighting is arranged in the frame, and the position of the lamp is relatively close. Strictly select the light distribution angle of the light, the targeted display of the jewelry features, the use of low power, multi-light source, fully express the jewel multi-section, high reflective properties, form a layer of high-gloss on the surface of the jewelry, play a sparkling role . The overall illumination of the window is about 600-1000 LUX, and the illuminance of the jewelry surface is about 2000 LUX. The color temperature depends on the material of the jewellery and the color of the surface, and the color rendering is not less than 90. The lighting design of the negotiation area focuses on creating a relaxed communication atmosphere. 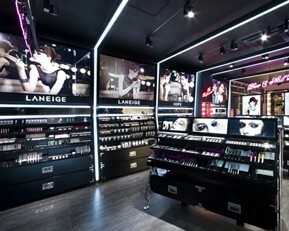 The brightness of the light should not be too high, try to use decorative anti-glare lighting equipment. In a hanging installation, clearly illuminate facial expressions, the color temperature should not be too high, to avoid giving people a sense of indifference. In order to facilitate the shopping guide to recommend custom jewelry display showcase styles to customers, the light should be concentrated on the work surface. The overall space of the negotiation area is 200-300LUX, the temperature is 3000K, and the key lighting is arranged around the room. As the product of the card neck, the key illumination is not less than 600LUX, and the overall space color rendering is not less than 90. 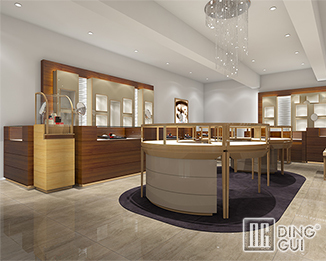 If you want to order jewelry showcase or learn more about jewelry showcase, please visit Dinggui Showcase Master's official website; http://www.dgfurniture.com/,or call the hotline: 136-1007-9233. Previous Page：You are already at the last pageNext Page： [Display Showcase]Do You Want To Be Trained By A Novice Or Directly To The Veteran? Information About "jewelry store showcase jewellery display custom jewelry display showcase jewelry showcase "
Hundreds Of Skills Are Not As Good As One, Dinggui Will Send You The Best Products. Why Do Jewelry Companies Want To Build Brand Awareness?